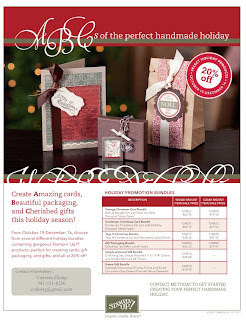 You can purchase select products--perfect for Amazing cards, Beautiful packaging, and Cherished gifts--at a 20 percent discount! See bundle flyer above. This offer is available on all order types (customer, demonstrator, workshop, and online). Additional products from current catalogs may be purchased on the same order. I will rebate shipping costs on orders over $50 placed with me by phone or on my website. If you have any questions, please feel free to contact me ..... svzhong@gmail.com.